People shout slogans as Turkey’s main opposition Republican People’s Party leader Kemal Kilicdaroglu (not pictured) walks on the final stage of his 25-day long protest (Osman Orsal/Reuters). The March on Justice, organized by opposition leader Kemal Kilicdaroglu, puts Turkish President Recep Tayyip Erdogan in a bind: He can try to stop it, risking violence, or he can let it go on and watch the already large procession of opposition grow. This article, which I coauthored with my good friend Howard Eissenstat, associate professor of history at St. Lawrence University, was originally published here in War on the Rocks on Friday, July 7, 2017. At the moderate pace of about 12.5 miles per day, a new crisis is slowly unfolding in Turkey. For almost three weeks, the previously uninspiring leader of the country’s main opposition party, the Republican People’s Party (CHP), has been walking from Ankara to Istanbul. 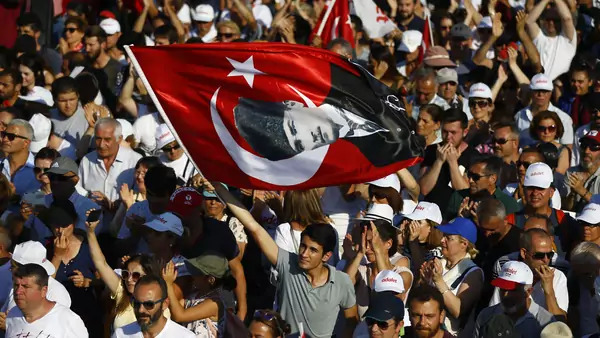 As the “March for Justice,” which now includes thousands of supporters, wends its way toward Istanbul this week, it puts President Recep Tayyip Erdogan in one of the most precarious political positions of his 15 years in power. Unlike last summer’s failed coup, which few Turks supported, the march seems to have resonated with a wide constituency. The demand for justice also happens to be a core principle of Erdogan’s political party, aptly called “Justice and Development.” The march puts Erdogan in a bind: He can try to stop it, risking violence, or he can let it go on and watch the already large procession of opposition grow. Whatever Erdogan decides, the march makes it clear that he is weaker than he seems and that Turkey is becoming less, not more, stable under his authoritarian rule. The March for Justice is a surprising stroke of genius for Kemal Kilicdaroglu, who, since rising to the leadership of his party in 2010, has been widely perceived as gentlemanly and well-meaning, but incompetent. The heretofore easily ignored CHP leader is, for the first time in his political career, defining events rather than responding to them. The stated reason for Kilicdaroglu to embark on his walk was the sentencing of a legislator from his own party, Enis Berberoglu, to 25 years in prison. Berberoglu, also a journalist, allegedly divulged state secrets about arms shipments to Islamist militants in Syria.